After making vegan cheddar cheese, I wanted to try baking with it. When Sylvia started up a request for tofu bacon I liked the idea of making muffins with both home made vegan cheese and bacon. These Bacon and Spinach Muffins were fantastic. Vegetarian. Dairy-free. Easy to adapt to Vegan. Chunky. Even rustic. Not overly cheesy but full of flavour. I think I would be right in guessing these are far less fatty than regular bacon and cheese muffins. Both the vegan bacon and vegan cheese don't ooze oil the way their omnivore counterparts do. So possibly the texture of these would be slightly richer if I had followed the recipe more religiously. I also decided to fry my onion and bacon separately because I have tried it together and it isn't great. We ate the muffins with some pumpkin and lentil soup (a bit like this one). It was fantastic. Not quite as early as I would have liked. I guess I did ok, given that I only started pressing the tofu at 5pm (and we ate at 7.30pm). Ideally the pressing and marinating of the tofu bacon should take hours but I take shortcuts here. As an aside I wanted to include some random reflections. I am really enjoying watching Puberty Blues. I think I read the book but can't quite remember. It was seen as x-rated when I was at school. The tv show brings back memories. I remember the Big M girls (I had a Big M beach bag), watching Storm Boy at the cinema (a friend of a friend had seen Greg Rowe somewhere and said he was really stuck up) and slang like 'dobbing', 'root' and 'mole' being in common parlance in my school playground (more than I would have liked). Not all is perfect in the tv series. I have noticed a couple of anachronisms. Tonight's episode is that it showed a mother going through the Australian Women's Weekly Children's Birthday Cake Book. The series is set in the 1970s and the book was published in 1980. Today we went into a fruit and veg shop where I apologised for Sylvia sampling the grapes. I offered money. Instead the "payer", as Sylvia likes to call the cashier, very kindly gave her a small bunch of grapes and waved away my offers to pay. I have seen a couple of interesting articles on veg*nism lately. Soy versus dairy: what's the footprint of milk? (in The Conversation, 28 August 2012) and Food shortages could force world into vegetarianism, warn scientists (The Guardian, 26 August 2012). 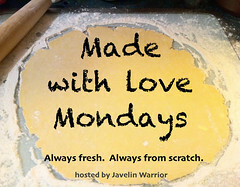 I am sending these muffins to Javelin Warrior for his Made with Love Mondays event. It celebrates foods made from scratch. It occurred to me yesterday that it is far easier for us to experiment than in our foremothers day. We have so many cookbooks, tv shows and the web. I recently saw a couple of ideas for vegan cheese (or cheeze if you are a purist) on Pinterest. I was able to read a few recipes, compare and contrast, tweak according to my ingredients, check another recipe for triangulation and suddenly I had cheese that I had made all by myself! With a little help from my friends! I come from a generation where there are many ways to get there, many versions, many diets, many amazing things to taste. The more I read and experiment and stock my pantry, the easier it gets. Yet I am still amazed I made cheese that I could grate on pizza and slice up for a melted cheese sandwich. Less exciting is the Sweet Potato Pasta Cheese Sauce that I made last week. It was very nice but not so different to hurry up pumpkin alfredo. Probably I lost my enthusiasm after I forgot about the the pumpkin I was roasting for it. The pumpkin chunks were burnt but fortunately I had some whole sweet potatoes in the oven too. GGG: Vegan food is so satisfying. E: But I thought you said it had cheese in it. GGG: no I said it tasted cheesey when I was talking about how good this vegan food was. E: Oh, I probably wasn't listening! I could have probably fooled E with this vegan cheese too. Yet I was so excited telling him I had made my own cheese and it was vegan. It is not the first vegan cheese I have tried. But it was far closer to the sorts of cheese I regularly eat and much quicker. My previous attempts at cashew goats cheese and almond feta made me happy. It's just that they took forever to make. They involved days of soaking, grinding and draining nuts. I started this cheese at 4pm and was grating it onto pizza at 7pm. I had been really excited last year when I first saw Veganangela's Cheese. Recent sightings of vegan cheese on Magic Jelly and Sweet Roots piqued my interest. Home made vegan cheese that slices rather than spreads were still a mystery to me. Yet the ingredients list was mostly already in my kitchen. I combined the recipes to suit what I had. I worried that I don't tend to use coconut oil. It is perfect for cheese that you want to firm up at room temperature and melt under heat. My ingredients seemed to need some extra fat. Instead of coconut oil, I used tahini but I think you could use cashew nut butter or white miso. And here is the dilemma with this cheese. When I compared grated dairy cheese and grated vegan cheese on pizza, the dairy swims in oil. It is not something I really want but I think it helps the melting. So today I had to try a staple of our house. Melted cheese on toast. (Or in this case, on pretzel.) It didn't look good. Again it held its shape. But when I bit into it, the cheese oozed. My next challenge is that I would like to bake with the cheese. Not sure what. Crackers? Muffins? Quiche? The cheese is not perfect. It is cheesy but would it really fool anyone if I did the comparison? The colour is more orange than yellow. Is that because smoked paprika makes everything orange? Are the flavours too strong? I would like to experiment more and hope I will. I am sending this post to Ricki for her Wellness Weekends Event. Fitting really, as it were her pinterest pins that inspired this cheese. Thanks Ricki! Dissolve apple cider vinegar in 1 cup of soy milk in medium saucepan. Set aside for the milk to curdle. Meanwhile dissolve agar powder in remaining cup adding a little milk at a time (I did this with only 1/4 of the milk as the recipe suggested but it made the agar agar really thick and lumpy when I added it to the mix later so maybe I would try adding the whole cup to the agar agar next time.) Set aside. Add smoked paprika, salt, nutritional yeast flakes, turmeric, and cashew butter. Gently bring to the boil (you can add ingredients as it is warming up). Then add soy milk with agar agar and cook for 2-3 minutes to allow agar to dissolve. Add flours and gently simmer, stirring contantly until it thickens like a roux and is coming away from the sides of the saucepan. Magic Jelly urged readers to use a stick blender to blend the mixture but this seemed quite messy. Instead I stirred it as vigourously as possible to give it a glossy sheen. Above is the graininess of the mixture when first coming together compared to the below glossiness. Pour into a lightly oiled container (or two ramekins like I did) as soon as possible. You can see in the below picture that even with pouring it when hot, it was starting to set as I scraped in the last few bits into the right hand ramekin. Cook and drain pasta according to packet instruction (I simmered mine for about 10 minutes). Mix together the rest of the ingredients. Add more milk if needed. It should be of a thick pouring consistency. Mine was a bit thick and I used 1 and 1/3 cups of milk. Toss through hot pasta. I am exhausted. It doesn't seem right after I slept in this morning and stayed at home most of the day. So I made pretzels, playdough, vegan cheese and pizza. And Sylvia was sick. And I had weird sci-fi dreams with soap opera stars. So I wanted to write all about the vegan cheese. If only I had the energy to share my excitement. Instead I will tell you about the cauliflower and almond pizza bases I made tonight. I told you recently about my failure with cauliflower cupcakes. I tried another cauliflower recipe tonight. As advised by Caralyn I made sure to wring out as much moisture as possible from the cauliflower rice. I also loved her method of pressing the mixture together between two sheets of baking paper. Quibbles aside, these were delicious. Less filling than regular flour pizza bases. Packed with vegetable and proteins. No kneading, no waiting for dough, no stodge. Definitely a hit! I am sending this to KR at Foodomania for Bake Fest, an event founded by Vardhini of Cook's Joy. Steam cauliflower in the microwave. I did mine til soft but perhaps should have done it a bit less. ("Just tender" is what Food to Glow says.) Blitz in the food processor until the cauliflower looks like rice. Spoon cauliflower into a clean teatowel and wring out as much moisture as you can. Return to food processor and add remaining ingredients. Briefly blitz to combine. Line two round pizza trays with baking paper and divide mixture between the two trays. Place another piece of baking paper over each dollop of mixture and flatten until quite thin. Bake (with baking paper on the top and bottom) for about 20 minutes or until golden brown (I did mine at 220 C but 180 C was suggested and might work better on a decent oven). Remove top layer of paper. Place toppings on and bake for another 7-10 minutes (7 was enough for me). It was a total failure in following instructions. And yet I was quite pleased with myself. Dinner tasted great and I had finally made a recipe for Dom's Random Recipes Challenge (#19). Before explaining the challenge, let me tell you that I really enjoyed making my own version of Lukas Volger's Black Olive and Roasted Potato Salad with Arugula, even if I didn't read the recipe and then threw in my disaster cauliflower cupcakes! One reason I decided to join in was that I found I had a really easy way of picking a random recipe. The idea of trying to pick a book from my shelves at random is just too hard. I have another way. Fortunately I am the sort of person who likes to list all my cookbooks on my blog, with the number of pages for each book. So I numbered the list and used the random number generator to find a book and then a page within the book. I thought I had the whole random recipe thing all sorted. Then the first recipe randomly chosen from the book Veggie Burgers Every Which Way was pretzel buns. Been there, done that, blogged the nervous breakdown. Noooooooooo! I wasn't sure of random recipe etiquette. 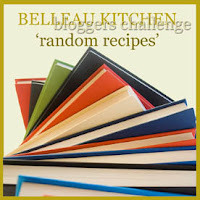 Make a recipe I have already blogged, pick another book, pick another recipe from the same book? I chose the last option. I foolishly threw the cauliflower crumbs in with the salad before I was smart enough to photograph it and pretend I never did anything so reckless. Later I got disillusioned and threw in Sylvia's leftover vegies. You might spot her abandoned peas in the top photo. I almost didn't blog this. Then I decided to throw caution to the wind. I loved the salad. I just had problems following the instructions. I hope Dom is forgiving. Honestly I would have taken a perfect picture if I hadn't been rushing around finding a pouch for Dolly (who was Sylvia's baby kangaroo), giving shoulder rides to Sylvia, running her bath, preparing her dinner, cajoling her to eat it, cleaning up playdough and playing hide and seek. I might have taken the photo after she went to bed but I had to organise photos, do my washing, read blogs and respond to emails. The next night, E didn't want dinner. I think he was sick that night. Or he had decided the salad had too many green leaves for his liking. I just can't remember back to a few weeks ago. Anyway, it meant there was plenty for me. Perhaps even a bit much. Especially when I served it with corn on the cob, brussels sprouts, tofu bacon and fried cornbread. Definitely a meal of random yumminess! Cook potato for about 5 minutes in boiling water on the stovetop until starting to cook on the outside but still uncooked in the middle. Toss potato and sweet potato chunks, olive oil and salt in two large roasting trays to give space to crisp up. Roast at 220 C for about 1 hour or until cooked and crispy around the edges. (NB my oven is quite slow - but I always check every 20-30 minutes unless I forget about the vegies altogether!) After 30 minutes I mixed the shallots with the potatoes and kept roasting. Meanwhile make the dressing by lightly whisking all ingredients (or shaking in a sealed jar). Toss half the dressing through the salad leaves. Mix potatoes, sweet potatoes, chives and pile on top of the leaves. Drizzle with remaining dressing. Scatter with black olives. Serve warm or room temperature. Plum and Cinnamon Oat Slice. April 2011. Photographed at a friend's place. I like the composition and the natural light. Nostalgia is also very powerful in photos. I love these sunflower plates that we ate off when I shared a student house with Nicki. During the Olympics Closing Ceremony, I spent some time pinning old blog photos onto a Pinterest Board. It was an interesting exercise in thinking about the photos on my blog and how they have evolved. Like many other bloggers, I have many embarrassing photographs in my early posts (and a few in later posts too). Choosing my Top Ten Photos wasn't easy, but at least the questionable quality of many of my photos made it easier to shortlist. My favourite recipes aren't always the ones with the best photos. And here is the frustration. When I love a recipe, I want the photo to reflect just how good it is. Yet it still feels like great luck when I am really happy with my photos. I have a lot to learn. Below and in the captions on my photos are some reflections. Gingerbread biscuits. August 2009. I love these Aussie cookie cutters. 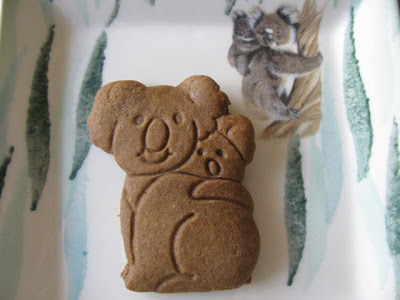 This photo has nice natural light and I like how the koala on the plate echos the koala biscuit. My camera. While people not cameras take great photos, the camera does help. I think I am now onto my third camera since I started blogging. I started using point and shoot Canon Powershot cameras. In December 2011 I purchased a digital SLR camera - a Canon EOS 550D (these are known as Canon Rebel cameras in the USA.) I mostly use a standard lens but I really want a macro lens, though the more I read about photography (as I have been doing recently), the more I think the perhaps I need more space around my food rather than more close ups. Haggis Nachos. January 2012. The tartan table runner and gingerbread men serviette signify Hogmanay or New Year. I like how the darker background makes the nachos seem lighter. Natural light. I can see in these photos what a difference natural light makes. It is not always easy to get my timing right. Some days I take photos in the morning but it is often done in a rush without time to think through a photo. Colours. I know that the accepted wisdom is that white is great to show up the food but I love colours and patterns. I need to learn to tame them sometimes. Plates and bowls. I collected quite a few of these that I love which enhance photos. Surfaces. My kitchen table is plain white. Too plain for me. I've started collecting fabrics, tea towels, serviettes etc with the sort of patterns I love. They need to be subtle enough to let the food be the star but pretty enough to make the heart sing. Aerial views. I noticed that some of my favourite photos are taken from above. Not only do they block out the clutter but they often tell more of a story than my usual close ups. Hands. I don't like to show faces on my blog but I find hands very expressive. They bring action and emotions to the photos. Smoky lime peanut baked sweet potatoes. June 2012. A quick lunchtime snap. New camera made the focus right, new teatowel looked pretty under the plate and I had lots of midday light. Plus I think I got the colours right. Clutter. My house is full of clutter that clamours for attention in the back of photos. I have got better at removing it but still need to work on this. A cheap foam board is a start. Getting the focus right! It is so frustrating to have everything right in a photo except the focus. No dedicated space to photograph. I take photographs in the midst of the chaos in our kitchen. I love seeing the spaces that bloggers set up for their photos but it just doesn't happen here. Taking pictures with a small girl underfoot. Often I am racing to take a photo before Sylvia grabs something out of the arrangement. Drinks. I find it really hard to photography drinks either as the star or in the background. Using the manual settings on my camera. I really need to practise using these to understand them better. Reading about this lately has made me think a good start might be to use the aperture only setting. Maybe I need to get some decent photo editing software. I use the most basic editing tools that comes with the computer and could really do with a tad more sophistication. Condensed milk fudge sauce. January 2008. This photo is not perfect but I still love it. The fruit is nicely arranged and catches the light like an old Masters still life. If I had my time over I would have reheated the sauce. Now on to the bookmarking sites. The web has many places to help organise and make connections. Recently I heard Russell Howcroft on Gruen Sweat say that if Twitter is teletext, Facebook is a letter. If that is the case then a blog is the newspaper column. Maybe we could say that Pinterest is the shop window and blogging is going inside the shop to take a look around, smell the spice, try on the dress or browse the book. I was attracted to Pinterest by its clean elegant style. It it so appealing to look at. I was frustrated that I had to have a Facebook or Twitter account to sign up but I dutifully signed up to Facebook. (Incidentally I am only using Facebook in a very limited fashion and am still very wary about it.) It then took me a while to work out about Followers and Following. Pumpkin fairy cakes. July 2011. This is Sylvia's hand. We decorated these cake for Dolly's tea party and the bright colours of the spotted plate and the kiddie table are cheerful enough for a children's party. I have found that some people I have not chosen to follow have got into these feeds and I can't work out how to get them out. I sometimes wish that people who follow me didn't have to see everything that I pin. For example when I did all the pinning from my blog during the Olympics closing, it seemed like navel gazing and I wasn't sure everyone needed to see that. It would be nice (but probably impractical) to decide what to share and what not to. I dislike how when I repin an image, the person's comments also are repinned. Again, I understand this is a matter of practicality. But I hate how it looks like I said that the brownies were the best ever or that my kid loved the snacks. I try and edit the comments on pins I repin but there are days when attention to detail is lacking. I try to include the name of the blog or website in the label/comment because it helps to promote it and also helps me remember where it is from. It is helpful when I repin to see other pins from that person's board and form the blog/website where the pin has come from. 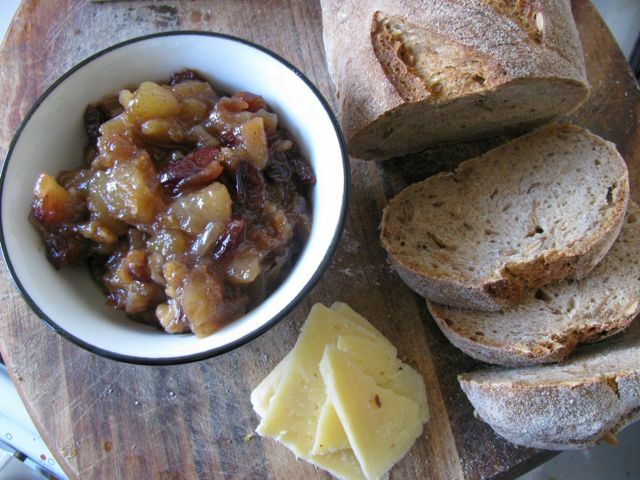 Pear and Walnut Chutney. July 2009. Good food photography is about suggestions for how to eat a dish. Bread and cheese and chutney is such a satisfying simple supper. The chopping board gives it a touch of rustic charm. Pinterest is great for sharing ideas with other people. I find it much easier to send a url to a board of pictures if we are talking about lots of ideas than to send a list of urls. One of the attractions of Pinterest is the clean design. When an image has a really long label or too many comments this messes up the look. I am still a bit unsure as to whether to create lots of specific boards or keep to just a few boards. I have written before about Pinterest copyright issues. I prefer to repin from someone else than to pin from a website. I generally try to pin from sites that are clear that they endorse pinning. I really liked Nupur's post on Pinterest etiquette at One Hot Stove. Cheese and onion beer bread. June 2012. I took this photo for the Queen's Jubliee earlier this year. I love the blue, red and white stripes that are so very royal but even more Mod! Long before Pinterest there was Delicious. Whereas Pinterest is great for choosing and sharing images, Delicious's strength is in organising and tagging urls. (There are thumbnail images but they are not nearly as pretty as Pinterest). While Pinterest is easy on the eye, I am still using Delicious because it is far more practical. I don't know any fellow blogger who doesn't get overwhelmed by bookmarks. Blogs offer far more recipes than we can ever make or remember. Searching the tags in Delicious turns up recipes from years ago that I had forgotten about. For example, if I want to search for a cake that is vegan and chocolate, I find it far easier to search recipes in Delicious than in any other system that I have used. It is amazing what old recipes have been found thanks to this system! Cheesy Carrot Nut Roast. April 2012. This is my favourite nut roast photo. Simple with lots of natural light and a small depth of field (ie blurry background). I particularly love just how meaty the nut roast appears. Enter the new kid in town. I have been aware of Eat Your Books for some time now but have only signed up in the last few weeks. You can browse my bookshelf via the link on my right hand menu. Eat Your Books is a system of indexing the recipes on cookbooks to make them searchable online. It is a great idea but I am still unsure of how it will work in practice. So far I have added 109 books to my virtual bookshelf. On my virtual bookshelf, 30 books have been indexed and another 2 are listed as to be indexed soon. I gather that over time more and more books will be indexed. It seems that on my virtual bookshelf, I can only search a fraction of my cookbooks. Unfortunately the ones that I can search are not necessarily the ones I prefer to use. You could argue this is good or bad! Who knew there were so many cookbooks in the world! When selecting my cookbooks from the library, I found it confusing was that there are many versions of many books that I own. Often I own an Australian edition but the USA edition is indexed. Some indexed books are linked to other editions. Multiple entries of books makes it hard to find the right edition. Thumbnails of covers helps. I like the system but it seems a lot of work. It took quite some time to add my cookbooks to my bookshelf. I can also add recipes but it seems a lot more work than tagging online recipes on Delicious and there are no images of recipes as far I can tell. Most frustrating is when searches bring up the meat recipes from my omnivore cookbooks. Fortunately a lot of my cookbooks are vegetarian. Delicious is better in bringing up only the recipes I choose to bookmark but it is not nearly as comprehensive. Incidentally, I have noticed that I can bookmark recipes so if I had the time this might help fix this issue. The biggest attraction of Eat Your Books is that is allows me to search my cookbooks so quickly when I don't have the time to flick through all my cookbooks. It has great potential to rescue cookbooks from being neglected in favour of online recipes. It is early days for Eat Your Books and me. I expect that Eat Your Books will only get more powerful as more and more books and blogs are indexed. I don't imagine that it will altogether replace the joy of sitting on the sofa browsing my cookbooks, but it an exciting way to marry my online blogging with my cookbook collection. Update August 2014: I have been enjoying using Eat Your Books when I want to cook with a particular ingredient. It helps me identify recipes in my cookbooks and actually does as it intends and takes me away from my online recipes and back to my bookshelves. Apricot Delight. September 2011. I bought these bowls at Tea Too and still had lots of orange wrapping paper which I used as a background. It nicely complemented the colour of the Apricot Delight. Do you have accounts with these sites? What do you think of them? I'd love to hear your thoughts and if you have an account that you would like to share, I'd be interested to have a look. Today was a day of backtracking. We set out for Fitzroy Market and went home to get my camera. We went for a walk in Brunswick Street and had to go back and find Sylvia's woolly hat. We wanted to go straight to hospital to visit my sister and her new daughter but had to head first home for the gifts. Finally after leaving Fran and Stella, we had to go back to their room to get Dolly who was left behind. So it is perhaps fitting that tonight I am posting a recipe with dried cherries that I had to head back for after doing the shopping. I bought the dried cherries at a local Middle Eastern shop. Dried cherries aren't that easy to find in Melbourne. I have bought them on a few occasions. I couldn't see any in the shop but I asked just in case. Yes they had them out the back. When I got home I discovered that these cherries were incredibly sour. Not so odd. What was surprising was that they still had the stones in them. I have never come across stones in dried cherries before. Baking biscuits late at night to take to work the next day was not an ideal time to be pulling stones out of cherries. At least it was better than a couple of weeks ago when it was so late that I made the mixture for tofu nut balls last thing at night and baked them the next morning before work. I left the biscuits in the oven a bit longer because I was concerned that they were too soft (especially given that my oven can be a bit slow). The next morning at work I worried they were too crisp. The birthday girl that I had baked them for was full of enthusiasm for my baking as always. Then at home I found the ones I had left there were pleasantly chewy. I swithered about posting these as I feel I should experiment further but, as I have noted before, it can take me a while and it is useful to have notes. Unfortunately we had eaten all the biscuits before visiting my sister. My experience of hospital food was so bad that I took some cheeseymite scrolls and finger buns from the local bakery. We also took gifts along. Sylvia's contribution was some of her "treasures" (see above in the yellow plate) which she wrapped in a serviette. 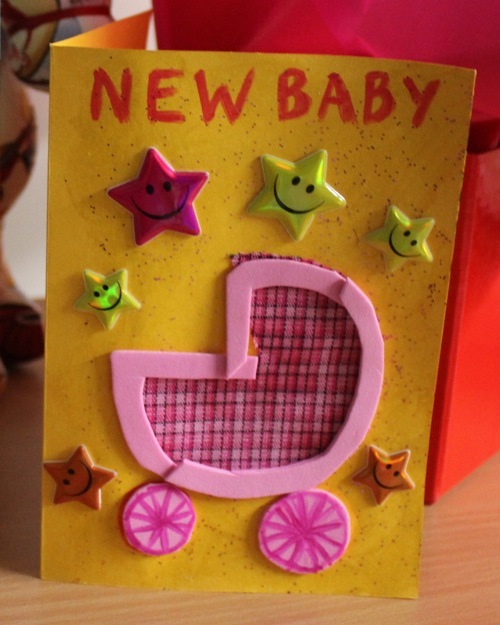 She also helped me make the below card. The recipe was inspired by the We Should Cocoa challenge. This month Janice of FarmersGirl Kitchen is hosting and the theme is cherries. Preheat oven to 160 C. Line two medium baking trays with baking paper. Mix dry ingredients in a medium mixing bowl. Add wet ingredients and mix well. Roll into balls the size of a walnut between your palms and then press between palms to flatten. Bake for about 20 minutes. I left mine in for another 10 minutes after the oven was turned off. Half were too crisp and then other half (on the less hot side of the oven) was nicely chewy. But next time I will just do 20 minutes. Cool on the tray. Last night I needed easy for dinner. E was out, Sylvia was eating on go-slow and I was waiting to hear that a new niece had arrived. I found an impressive looking recipe for African Curried Coconut Soup with Chickpeas on Joanne's Eats Well With Others blog. She always manages to make heaps of vegies and protein look delicious. With tinned legumes, pre-cooked quinoa, and some kale from my mum's garden, this came together quickly. I also added a few leftovers from the fridge and have tried to reflect this in the recipe. What is sometimes harder to reflect in writing the recipe is that I took some of bits and pieces out of the other ingredients to feed Sylvia. I gave her some of the cooked quinoa to try. She wasn't keen. Too strange? I was sneaky. I'd hang my head in shame if it hadn't been such an inspired move. I added some quinoa to some mashed potato and wholemeal flour to make amazing Tattie Scones. We all loved them. Great accompaniment to the soup. Which brings me to the vexed question of soup. E likes to tease me that a spoon can stand up in my soup. When I first added all the ingredients (see second photo) I thought it was a really soupy soup. I put Sylvia to bed and came back to have my dinner and found that the soup had thickened and the spoon was indeed standing upright. So yes, I love soups that might well be stews in another kitchen. I am sending this soup to Jacqueline for No Croutons Required. This month the theme is coconuts. And congratulations to Fran and John on the arrival of wee Stella! Cook the quinoa by cooking in 1 cup water, bring to the boil and simmer about 20 minutes. Heat olive oil in a stockpot. (I used a large saucepan which was a wee bit too small.) Fry onion, carrot and capsicum for about 10-15 minutes or until soft. Stir in garlic and spices for about a minute or until fragrant. Add remaining ingredients except spinach. Simmer for about 10 minutes. Check seasoning and adjust to taste. Add baby spinach and cook another few minutes until spinach is wilted. Serve warm. Lately I have had a hankering to bring together chocolate and coconut in baking. Now let me make myself clear. The more I look at the recipes of my childhood, the more I see how much they included coconut. In these days, 'coconut' meant unsweetened dessicated coconut. Nowadays, 'coconut' can mean coconut milk, coconut cream, coconut oil, coconut butter, or large coconut shreds or flakes. When I say chocolate and coconut, I am referring to dessicated coconut. Last week I went to visit my sister Fran and took along a chocolate coconut slice from Emily Rose's Have Your Cake. I'd admired the picture so long but it was more slice than cake. (I should have let it cool in the tin rather than turning it out like a cake.) It was nice but not what I was after. We ate it for dessert with ice cream. Sylvia had sprinkles on hers, which she loved. On Sunday night I tried again with some Fudgy Coconut Brownies. that I had seen at Chocolate Log Blog and Nip it in the Bud. They were easy enough to fit in between Grand Designs and a documentary called Roman Polanski Wanted and Desired. They are incredibly soft when they come out of the oven and need to cool down in order to be firm enough to cut. The smell of chocolate wafting through the loungeroom was very very hard to ignore. Last night E and I stayed up until 1.30am to watch the Closing Ceremony of the London Olympic Games. While Olympics aren't usually our thing, the ceremony was all about British music, which both of us love. It was fantastic entertainment. From the raw emotion of footage of John Lennon singing 'Imagine', to the humour of Eric Idle singing 'Always Look on the Bright Side of Life', to the unabashed enthusiasm of the crowd singing along with Madness to 'Our House'. I also admired the strength of Gary Barlow who sang with Take That, a week after his baby girl, Poppy, was stillborn. We had bangers and mash for dinner, a crisp sandwich and brownie. Not the most wholesome food but it fitted right in with the relaxed vibe of the evening! I am in love with this brownie. The texture of dessicated coconut is a bit more subtle than what I was after. I've written a list below of other recipes to try from other blogs. However the dense, chocolatey, fudgy brownie with a little bonus of coconut, is just heavenly. According to Sylvia, wicked witches also love the brownie. As I had bookmarked this recipe from both Chocolate Log Blog and Nip it in the Bud, I am sending these brownies to Tinned Tomatoes for Bookmarked Recipes, an event founded by Ruth's Kitchen Experiments. Preheat oven to 180 C, Grease and line a 22cm square cake tin. Place cocoa, butter and sugar in microwave proof mixing bowl. Heat in the microwave until butter is mostly melted (because it will keep melting after it comes out - this took me about 1 minute). Stir in eggs. It will thicken slightly and look glossy and gorgeous. Stir in flour and coconut. Pour into prepared cake tin. Bake for about 45 minutes. Check after 30 minutes and cover with foil if it is browning on top too quickly. I think the only way to know it is done is that the top is cooked but it will be so soft in the middle that I didn't bother with a skewer - after all brownies should be a bit gooey in the middle. Cool in the tin. Cut into squares. Keep in an airtight container. We have spent most of the weekend at home after a week of illness last week. In my kitchen I have been baking. I was inspired to make Treacle scones by the announcement of International Scone Week by Celia, Joanna, and Heidi. I used a slightly different recipe (by Ena Baxter) to my usual. It needed more milk. I need to learn to judge scone dough consistency. So instead I am sending this post to Celia for her In My Kitchen Series. In my kitchen are tins of beans I don't usually find canned. Black beans. Pinto beans. Adzuki beans. They were purchased at Wholefoods in Brunswick. I am still deciding how to use them. In my kitchen we have been enjoying snacking through pretzels, soy sauce rice crackers, chilli rice wheels, rice snacks, and fruit balls. This is the best fundraising package so far from Sylvia's child care centre. We sold a few but we enjoyed them too much to hawk them about much. In my kitchen these La Zuppa soups are just passing through. I take them to work to eat for lunch if I don't organise a packed lunch. I used to be very good at making my own soups to have at work but I don't make them as much these days so I usually rely on leftovers or sandwiches if I like the bread we have about the house. In my kitchen are many salts. I was surprised at how many I had when I decided to photograph them together. Saxa is the cheap supermarket salt. Wild garlic salt (in the plastic bag) bought in Healesville. Maldon salt is in the spice hog. Australian Lake Salt is yet to be opened. French Lavender Salt and Fumée de Sel (smoked salt) come from Gewürzhaus in Carlton (where I did a double take at $13 for a small bag of smoked salt). I don't know how I became such a salt fiend! In my kitchen is a new Gaspard and Lisa bowl that my mum brought Sylvia back from Paris. Sylvia loves watching this cartoon on the telly. Unfortunately the ABC seems to have been changing around a lot of kids shows and a few that she loves have been taken off the schedule. My mum also brought back an icing pen for me. I haven't used it yet but am looking forward to doing so. I am sure it will be very handy for icing birthday cakes! In my kitchen is ice cream. This is odd. We rarely buy ice cream. Especially in winter. Sylvia and E started drinking smoothies last weekend when they were ill and now they want ice cream too. I haven't had this Skinny Cow ice cream before. The caramel ice cream is creamy and had a nice flavour but the chocolate biscuits taste slightly plastic. Nice for a change! In my kitchen is a sumo mandarin. It is one of the ugliest pieces of fruit I have ever seen. I am not sure I can bring myself to eat it. Yet I could spend hours just gazing at it in fascination. In my kitchen are craft projects. I was inspired by Brydie to knit this scarf. I couldn't resist buying this wool of many colours. I've promised a scarf for Dolly and George but haven't had the heart to pick up the knitting needles again since finishing this scarf. I hope one day to do tassles on a scarf and learn to knit beanie hats. Can you guess what our other craft project has been? Emerald City? Yellow brick road? Why yes! Wizard of Oz characters made out of toilet paper rolls! I wanted the witch's hair to be green but Sylvia insisted on red. We used coloured paper, coloured foam sheets, googly eyes, wool, string, fabric, paper bags and foil. By the time we got to the tin man, Sylvia had lost interest and my attention was waning but I wanted to finish it. It was a fun activity. I am sending these to Red Ted's Art Blog - lots of other craft ideas there!